The ‘Honeycomb Vase’ by Tomas Gabzdil Libertiny debuted in Milan last year as part of Droog’s exhibition. 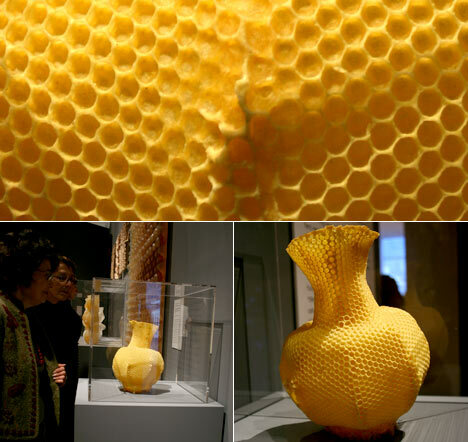 The vase is literally made by bees. Libertiny constructed the piece by making a vase-shaped beehive scaffold which was removed after one week, and the efforts of approximately 40,000 bees. The designer coined the term ‘slow prototyping’ as an ironic counterpoint to today’s rapid prototyping technology. Description: The project was conceived in 2005 as part of Tomáš Libertíny’s graduation project. The series of vases were completely “made by bees”. After 4 months of learning from beekeepers the inner workings of nature, Libertíny invited new colonies of bees to participate on his designs. The result was now iconic edition of vases. 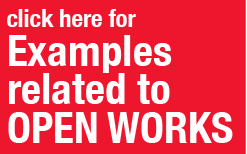 The project extended into other works under the “made by bees” concept. In 2008, one of the vases was acquired by MoMA after being featured in Design and The Elastic Mind exhibition.